Here we are for lunch with some lovely people who have ventured all the way from Sydney’s Northern Beaches on what is a chilly Sunday afternoon. We debate the cafe choices around Darlinghurst before settling on Stanley St Merchants by Icon Park. It’s a crowd funded venue (this is where different proposals are put to the public via social media and one that raises the highest funds from the public gets the right to set-up the restaurant with those funds… very hipster), which makes me a tad sceptical about its cred, but I overcome my initial hesitation to recommend it to my guests and we all make our way in. There is a lovely selection of baked goodies which prove to be very welcoming for any new customer. The menu is also super creative, with one of the dishes being a scallop, caviar and kim chi omelette with seaweed mayo… I am actually quite impressed. We start with some drinks… my lovely dining companions are in the mood for coffee. The waft of the beautiful espresso flavour permeates the air as all the guest sip on their cappuccinos, lattes and the like. The conversation starts, and its one those typical lazy Sunday chats. First we start discussing one of our dining companion’s recent trip to Melbourne, where we all agree the little laneway cafes in Melbs are the best (p.s. 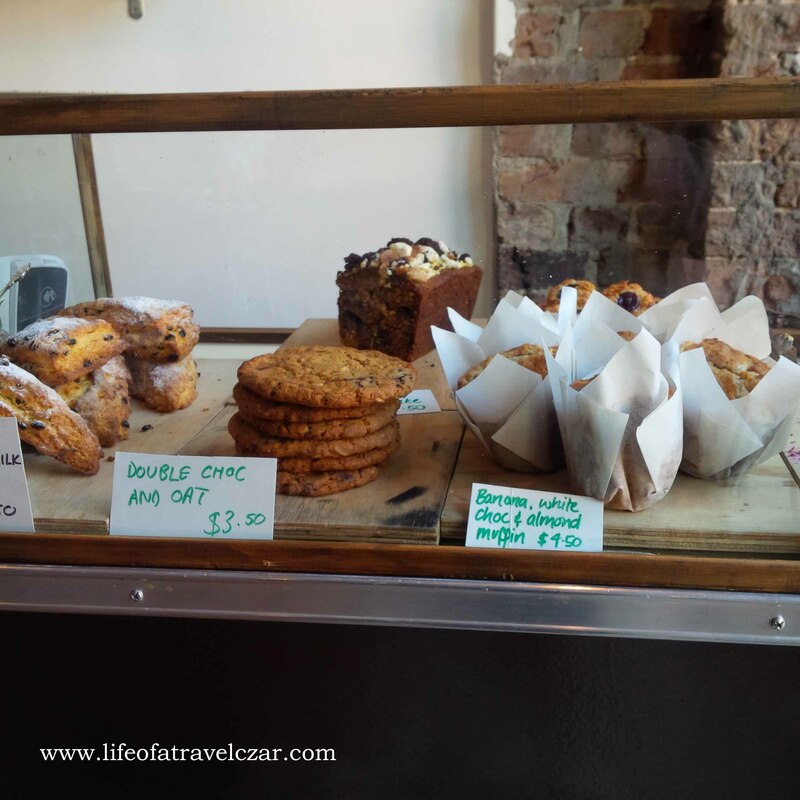 if you need Melb dining tips, check out my recent trip report)! The conversation then flows onto my love of air planes (okay I see you rolling eyes, so I’ll move on) and because I am so good at sharing my opinion (especially when I’m not asked for it), I also spend some time trying to convince one of the girls (who is a bit of a fashionista) that she should start a fashion blog similar to Tuula Vintage. The conversations temporarily pauses, as there is a minor hiccup on when our dining companions orders a Chai Latte. Well lets put this way the cafe seems to have a very different understand of Chai Lattes…. but everything eventually gets sorted out. Unfortunately I skip the coffee, still recovering from a 007 themed party from the night before (check out my review of that amazing party here! ), I opt for a Bloody Mary instead. The taste of juicy fresh tomatoes mixed with tangy spices with the beautiful green celery is a welcome “Wake-up Travel Czar” kinda drink. Its a sensational drinking experience, as the glow of the lovely Sunday sun fills the cafe to brighten the mood. I love sip longingly on the drink with my straw, as I try to stay engaged in the conversations. It’s a good Bloody Mary, but probably doesn’t top the ones they do at Bagatelle (check them out in my amazing breakfast guide). One of the girls has the banana bread. She later describes it to us as one of the best banana breads she has had, with special note for the combination of the banana, dates, walnuts and the (if I recall it was a ricotta) topping. Another couple order a jelly doughnut, which looks oh so inviting. Unfortunately I did not get their opinion on it, but it looks a treat. I decide to go for the Kangaroo burger. Let’s start with the architecture of burger. There is grilled brioche bun, cabbage, mixed in cheddar cheese which encases the juicy Kangaroo patty and a bright green lettuce leaf to round out the experience. I will make an upfront confession, I love game meat, so my opinion of this burger is kinda going to be a little biased. The distinct gamey flavour of the Kangaroo shines through the burger, while rich, creamy sharp cheddar taste provides a beautiful flavour interaction with the patty. The amazing crunch of the cabbage and lettuce provide a texture contrast to the succulent patty and soft melted cheese to round out the experience. There is a light aioli on the base, but its overpowered by the cheddar and Kangaroo. Very straightforward dish (which can be often botched) executed very well. The potato skins are also lovely there is flaky crispy texture to them with the right level of seasoning and they make this lovely poetic crunch with every mouthful. So the afternoon starts to age and we decide to sign-off and meander down the street having thoroughly enjoyed our lunch. I must say for a crowd funded venue, this place offers a creative menu and some well executed dishes, with a little sparkle of creativity. Sundays are beautiful! Burger looks good but I can’t stand brioche!